How Do You Know If You Have A Sleep Disorder? There are many sleep disorders, but some of the most common – sleep apnea and sleep bruxism (grinding or clenching your teeth) – go undiagnosed or misdiagnosed. Unfortunately, if left untreated, sleep apnea can cause further health complications and sleep bruxism can greatly endanger your oral health. But, both of these disorders present with their most obvious symptoms while you’re unconscious – so how do you know if you have a sleep disorder? If you sleep next to someone, they may be complaining about your loud snoring or teeth grinding. But, this isn’t always the case – so let’s explore discovering and diagnosing sleep disorders. If you’re suffering from sleep apnea, you’ll most likely experience symptoms like; excessively loud snoring, abrupt awakenings throughout the night, and breathing cessations. 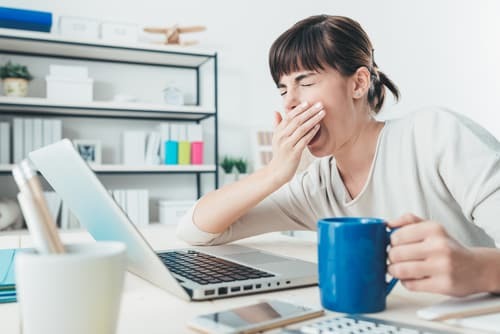 However, during your awake hours – you may notice symptoms that indicate conditions like fatigue or depression such as; irritability, moodiness, excessive sleepiness, etc. If you’re experiencing any of these, it’s time to consult with your doctor. Bruxism is a little different, you’ll probably notice more symptoms that indicate complications with your teeth. For example, if you’re grinding your teeth in the night, you’ll probably wake with a soreness or aching feeling in your jaw. In some cases, you may have tooth sensitivity or even notice excessive wear on your teeth. In extreme cases, you could damage your teeth by chipping or even breaking them. The best thing to do is call your dentist at the first sign of jaw pain – the earlier you’re able to catch it, the better. If your doctor suspects that you’re suffering from a sleep disorder, they’ll recommend a sleep study. This can be done either in a sleep lab (which looks more like a hotel room) or your home (in some cases). Throughout your sleep, you’ll be monitored by a machine that will show your doctor your breathing patterns, oxygen levels, heart rate, along with many other vitals to reach a diagnosis. If you’re experiencing any of the above symptoms, please don’t hesitate to visit your doctor. Untreated sleep disorders can be dangerous and should be treated as soon as possible!